Bryony Tyrell will be making her fifth amateur MMA appearance tomorrow night, Saturday, February 21st on UIC 14 at GL1 Leisure Centre in Gloucester. Bryony trains out of Exile Gym in Southampton; is a working mum with two children and competes up and down the country. Here I get to find out what Bryony has been achieving since I last spoke with her 18 months ago and I for one can say WOW! It has been awhile since I have last caught up with you [July 2013] and since then you have been one busy lady. Can you talk me through the last year of your achievements for which I know you have achieved a lot. It’s lovely to catch up with you again, I can’t believe it’s been that long! Yes it has been a very busy couple of years. 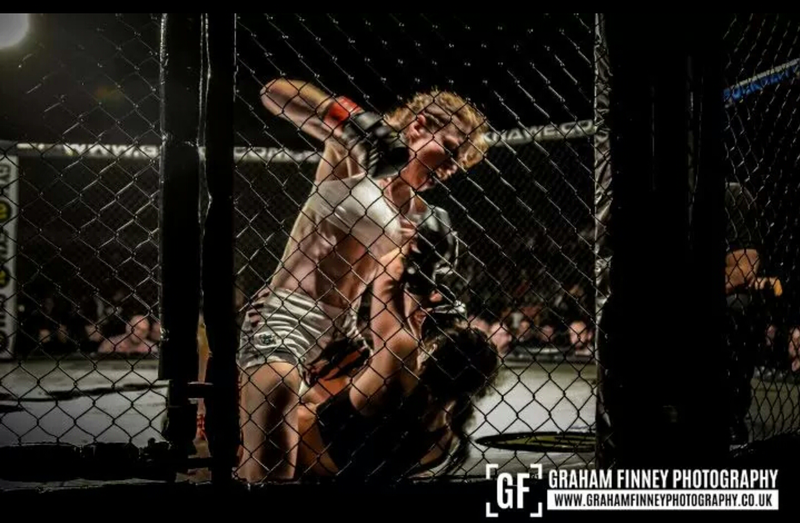 In October 2013 I fought on Extreme Cage Championships – Banned 1 in Blackpool and won by split decision. A few weeks later I was asked to do a white-collar boxing match at short notice in Andover which I won by decision. In November I fought on the Muay Thai World Series in Bournemouth and lost by decision. In December I fought Main Event (MMA) on a small local show in Andover and won by first round rear naked choke. The day after that I competed in the Grapplers Showdown Strike and Grapple UK Championships in Watford winning Gold in my weight division (-60kgs) and Silver in the absolute (NoGi). In February 2014 I competed in the Hampshire Open Grapplers Showdown and won Silver in both my weight division (-60kgs) and the absolute (NoGi). In April, at the Grapplers Showdown London Open in Watford I won Gold in my weight division (-55kgs) and bronze in the absolute. In May I was lucky enough to fight on Cage Warriors 68 in Liverpool and lost by decision. In September I competed in the Grapplers Showdown London International NoGi Open and won silver in my weight division (-55kgs) and amazingly won the absolute! The week after I competed in the British NoGi Open in Birmingham and won Gold in my division (-56kgs) and Bronze in the absolute. The week after that I fought on Warrior Fight Night in Bournemouth (Muay Thai) and won by decision. Last but not least (lol) in November I fought on Shock ‘n’ Awe in Portsmouth (MMA) and won by TKO second round. That’s a lot of achievements for a working mum of two, to fit all of those achievements into your ‘spare’ time. How do you do it? I’m not really sure how I managed to do all that. My life is absolute chaos for the most part to be honest, but I love it! I couldn’t do it without the amazing support of my husband, coaches and teammates. You train out of Exile Gym in Southampton, alongside Arthur Frost who is another top amateur MMA fighter and also Pro fighter Benny Carr. How does it feel to train alongside Arthur and Benny when it comes to a fight camp? Benny and Arthur are a massive inspiration to me. Arthur in particular has helped me out immensely; I’m very lucky to train side by side with someone of his calibre. Your’re now 2-2 in your amateur MMA career; have been on one of the biggest shows as in Cage Warriors, when can we see you make the move to the Pro ranks? My aim was to turn pro at the end of this year if I do well in my next two amateur fights. My concern with turning pro though is the lack of opponents at my weight. The amateur scene for women is definitely expanding but the pro level still seems to be very scarce in the UK. 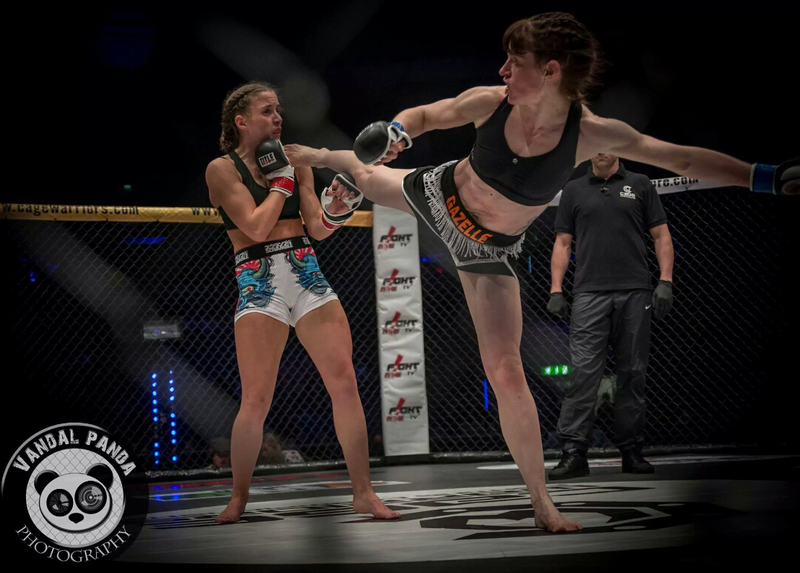 You’re facing Jemma Jacques at UIC 14 at GL1 in Gloucester this Saturday February 21st in an Amateur MMA bout; do you know much about your opponent or the challenges she may pose on the night? I know quite a lot about Jemma because I’ve been matched against her before. I’ve never met her but I like her. She seems savvy and a bit fiery, good characteristics for a fighter . We’re both from a kickboxing background so I’m quite familiar with her fighting style. She has powerful striking which I’ve got no doubt could cause me serious problems if I don’t keep moving (lol). Where do you feel that you will be stronger in this fight and where do you feel it may end up? To be honest I’m not sure what will happen on Saturday, I’m quite comfortable standing and on the ground, although I think my grappling is stronger. I expect this fight to go to the ground at some point where I think I’ll dominate. Are you still part of ‘Rosi Sexton‘s’ mentoring scheme? If so, how is that going? I’m not part of Rosi’s mentoring scheme anymore. She was understandably very busy when she got signed to the UFC so I think that went on the back burner. I will always be very grateful for the help and advice she’s given me. She’s a true icon for WMMA. What did you think of TUF 20: A Champion will be crowned? I really enjoyed TUF 20. It was quite interesting to have an insight into some of my favourite fighters. It’s a shame they gave so much airtime to the more unpleasant characters in the house. Angela Magana was particularly vile. It was nice to see Jo Jo and Aisling coming across so well, both a true credit to WMMA. After your fight will the ‘Gazelle’ be eating lots of cake? Haha…yes I’ll definitely be eating lots of cake after the fight, I might even indulge in a cheeky cider too! I can’t relax too much though because I’m fighting again in March. Lastly, is there any sponsors or anyone you would like to thank? I don’t have any sponsors, only my brother who spoils me with random MMA related pressies..lol. So obviously I would like to thank him and my beautiful sister-in-law Lisa who are always there for me. I’d also like to thank all my fantastic coaches and training partners at Exile and Look Borai, in particular Daniel Bourne, Gareth Blair, Dean Kendall, Janis Meiksans, Trevor Birmingham, Jarrod Speed, Rich Harding and Arthur Frost. I’d also like to thank my Mum for being brave enough to come and watch me and last but not least my husband for enabling me to chase my dreams and only complaining a little bit..lol. Thank you for your time Bryony it is very much appreciated. Bryony is next fighting on March 28th on Phoenix Fight Night XXV at the 02 Academy in Bournemouth. You can follow Bryony on her Twitter here. If there are any sponsors out there that would like to sponsor Bryony (every little helps) you can contact her via her Facebook. I for one know she would be very grateful.